It's been some time since I posted here at Matsuzaka Watch, but I assure you it's not for lack of interest. I've had my hands full with some very happy and important business. On New Years Day my wife and I were blessed with the arrival of our first child, a son. There are no words to describe this experience, but indeed I consider myself the luckiest man on the face of the Earth. 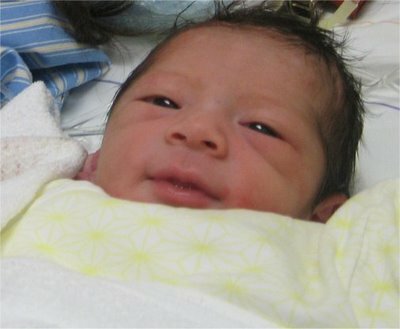 Hiroto (HEE-roh-toh) Plugh (Ploo) is 7 pounds, 5 ounces and 20 inches long, born at 7:42am on the first day of 2007, year of the boar. His wingspan is absolutely ridiculous. He's all arms and legs like his daddy was, way back when. My wife is a lefty so I'm hoping the free agent market for pitchers hasn't dried up by the time his rookie contract is up sometimes around 2036. At any rate, his lullaby has been "Take Me Out to the Ballgame" since he was conceived and he heard it for the first time on the 1st, as a member of the air-breathing world. He smiled. Congratulations! If you ask me, he looks like a future major leaguer. Hi, im a red sox fan and found out about your website when all the matsuzaka mania started happening. his stories from high school to now really are amazing and i cant wait ot see what he does with the red sox. ever since i saw him pitch on youtube i was for sure the yanks would get him, but im glad with the way things turned out. anyways, i just wanted to say i really like your work on here and sometimes feel sad for you since daisuke wont be a yankee, but love taht he's with the sox. imagine how good of a bedtime story the daisuke matsuzaka saga will be. first pitching in japan, then coming to america, going to your arch rival....that should be fun. have fun with the new baby and thanks for all your work on daisuke!!!! Many congratulations -- great news. many congratulations... many times over, sir. may Hiroto create a new pitch that is the sensation the world over 25 years from now. found you via a serach on goggle...great write up on the baseball player...and wow! Congrats! Boras relieved? Matsuzaka to Take Offer?